1. Wagemakers uses this classification of al-Maqdisī as a “quietist-jihadi,” as opposed to another sort of jihadi, to account for the extent of his influence in different Islamic contexts. 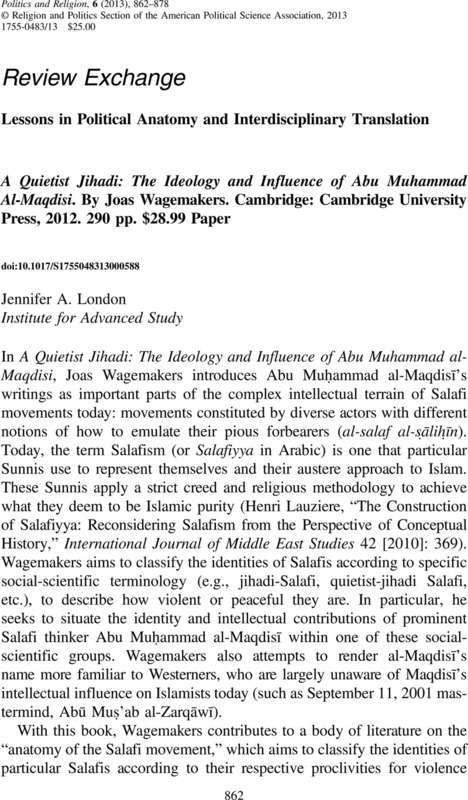 So, for instance, he suggests that al-Maqdisī’s “quietism” makes him more popular at certain moments in Saudi Arabia, an environment Wagemakers claims is more conducive to such “quietism,” and less popular in Jordan, where Salafi students favored more violent modes of opposition (e.g. those espoused by al-Maqdisī's student al-Zarqāwī). 2. Also helpful is the way that Wagemakers shows political theorists, unfamiliar with Quranic injunctions, how al-Maqdisī amends Quranic suras to advocate for his political vision. He shows, for instance, how al-Maqdisī re-deploys a Quranic sura that esteems Abraham (as representative of ideal behavior in his renunciation of false idols) as a sura that advocates renouncing Islamic governments. In this way, Wagemakers introduces al-Maqdisī's ideas and the rhetorical means by which he espouses them to spur his students to jihad.